Today, for Tag Team Tuesdays, I wanted to continue looking at classics and greatness. With that being said, the Ruthless Aggression is the greatest era in wrestling and after covering Attitude Era Tag Teams, it was only right I return with a look at 5 classic tag team matches from the Ruthless Aggression era. Let's take a look at five classic tag matches from the best era of wrestling. -I can't say enough about this match honestly. For two makeshift tag teams, you would have never expected their chemistry to be so solid. However, that was 100% the case here. 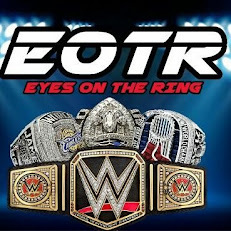 Edge and Mysterio worked very well together and took Angle and Benoit to the limit, but it wasn't enough. There are so many great sequences throughout this match, and the ending was poetic with the tapout to give Angle and Benoit the distinction of becoming the first ever Smackdown Tag Team Champions. This would kick off the short lived but honestly legendary tag team feud with Rey/Edge, Angle/Benoit, and Los Guerreros as they would trade tag team titles and have multiple classics over the course of one month. I'll get to another of those classics in just a minute. Still, this match is always worth 20 minutes of your time, as it might be one of the greatest tag team matches EVER. -To many, this is known as TLC 4. RAW in the Ruthless Aggression era was pretty subpar overall, but this match was one of the bright spots in this era. It was supposed to be Kane and The Hurricane teaming up on an episode of RAW Roulette against tag team specialists and TLC veterans Jeff Hardy, Christian, Bubba Ray Dudley, who were without their usual partners. With Edge, Matt Hardy, and D-Von Dudley all on Smackdown, the three veterans of the stipulation got to pick their partners, and they didn't disappoint. Jeff picked RVD, Christian picked Chris Jericho, and Bubba picked Spike Dudley (okay maybe his choice was a bit disappointing), and Kane was left without a partner as the match kicked off. The Hurricane was attacked backstage and Kane went at it alone. After a long battle with a number of great spots and moments, Kane climbed the ladder and took down the belts, retaining the tag titles in one hell of a battle and one hell of a contest. TLC 4 was insane and doesn't get enough credit in tag team wrestling. -Now, we can get back to the legendary era of Smackdown. There are so many matches I could reference, including a classic 2 out of 3 falls match on Smackdown between two of these teams, but this one was special. It was a shock, because as an elimination match, I fully expected the Guerreros to get eliminated first, but to my surprise, they didn't. The team eliminated first was my pick to win, Angle and Benoit, but I think it all played out the right way, because it took those two out of the tag title picture and put them back into the hunt for singles competition. The Guerreros picked up the win and surprised everyone, but the match itself was a true classic. -It's impossible to talk Smackdown in 2003 without talking this match. Chavo got injured and Eddie was without a partner so going into this match, he needed a new partner. Look no further than Tajiri. Tajiri and Eddie together seemed like a bit of a stretch but together they worked in perfect harmony. 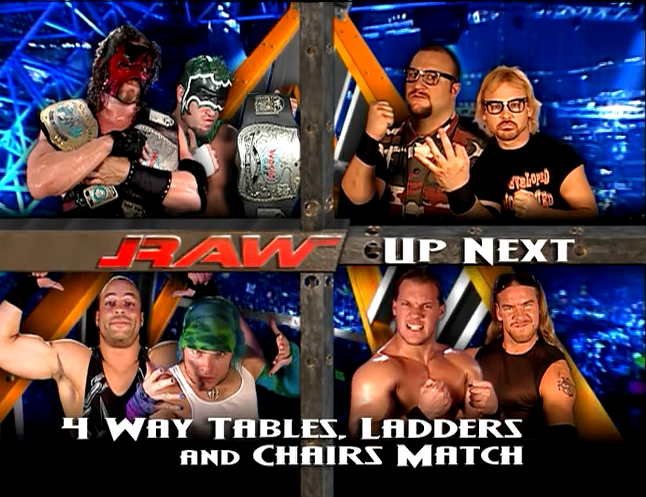 Add in Team Angle and a Ladder to the mix and this was a recipe for a classic match. Through 15 minutes of hard fought action, some exciting spots, and all around great wrestling, these four men gave the world a classic and we got new tag champs in Tajiri and Eddie. -The ending of the Ruthless Aggression era came shortly after this match, and this is the best match to end this list off on. What was originally supposed to be a standard two on two tag team match got turned into a Fatal Four Way tag team ladder match and the match woud end up changing a lot. Joey Mercury suffered a vicious injury through this match, and while that remains a highlight, the match itself was a great contest to watch. With each team bringing their best, it was a toss up on who could win, but momentum proved to be on the side of Kendrick and London, as they walked away with the win and the tag titles. The contest was a great way to close out the era of tag team wrestling in the Ruthless Aggression era, as tag team wrestling wasn't the same for nearly 10 years. That's why the Ruthless Aggression era was so great. It put a focus on what needed to be focused on.